One of the strangest-looking of all mammals, the duck-billed platypus is the size of a rabbit and has a unique bird-like bill. It is one of only three mammals in the world to lay eggs. Where does the duck-billed platypus live? The duck-billed platypus always lives near water, inhabiting the rivers of eastern Australia and Tasmania. It nests in tunnels that it digs out of the river banks, although sometimes it will live in deep crevices and little caves in areas where the river runs between rocky banks. Their tunnels can be in the region of 15 metres long, although they are usually much shorter. The duck-billed platypus is truly amphibious as it is perfectly at home on both land and water. It lives a solitary life except during the breeding season, and is considered to be quite territorial in its need to secure stretches of the river for feeding rights. It uses its strong, webbed front feet for both swimming and burrowing. When it walks on land, it curls these feet right under its body in order to protect them. What does the duck-billed platypus eat? The duck-billed platypus finds its food in the water, where it hunts for small prey such as insect larvae, water snails and small crustaceans. Under the water it closes its eyes, ears and nostrils and uses its broad bill to locate prey. The bill is soft and pliable (not hard like a birds) and is highly sensitive. The platypus sweeps it from side to side as it searches along the bottom of the river. It sometimes remains underwater by wedging itself below a log or in a crevice under a stone. Down on the river bed, the platypus takes food up into its cheeks. When the cheek pouches are full, the platypus comes up to the surface again. There it discards any sand and stones that it has accidentally picked up and grinds the food between the horny plates it has instead of teeth. It swims along using its front feet only, and most of its dive lasts between half a minute, and a minute and a half. However, if need be, the duck-billed platypus is capable of staying submerged for longer. 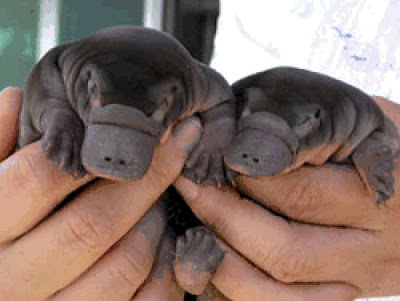 The male and female platypus come together to mate between August and October. The courtship takes place in the river, with the prospective pair swimming around each other. 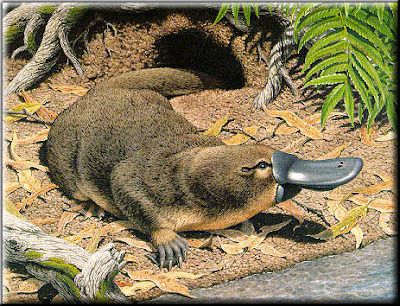 The female platypus then digs a long nesting tunnel in the river bank with a birthing chamber at its end. The nesting tunnel is longer than the platypus’ home tunnel – it may be as much as 20 metres long! The female collects grass and leaves and carries them back to the tunnel grasped under her tail. She then constructs a nest within the birthing chamber. There, she will lay two white, soft-shelled eggs which she incubates by holding them snugly between her tail and belly. Each egg is about the size of a large marble. The hatching period is thought to be variable, but after about 1-2 weeks the eggs will hatch and the young make their way through their mother's fur to a glandular patch where milk is produced. The youngsters stay within the burrow for 4-5 months, and continue to take their mother milk after they have left the burrow. They are playful, and have been seen to romp around like puppies. 1. The duck-billed platypus has a hollow spur on the back of each of its rear feet. Each spur contains enough poison to kill a dog. The spur may be used in rivalry fights. 2. The platypus is considered to be one of the most primitive of mammals. The only other mammals that lays eggs, like their reptilian ancestors did, are the platypus’ only relative – the two echidnas of Australia and New Guinea. 3. When the first species of this mammal was seen in England in the late 1700’s, it was thought to be a fake. Scientists assumed that a joker had stitched together a duck's beak and a mammal’s body. 4. At around 32 degrees Celsius, the body temperature of the platypus is remarkably low for a mammal. 5. The duck-billed platypus can change its shape very easily. Its body is like a strong tube of muscle and it can easily squeeze through narrow spaces and out of someone’s grip. 6. 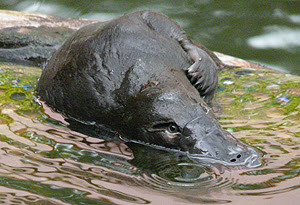 The word platypus also comes from the Greek for 'flat' and 'foot'. 7. The duck-billed platypus can sense prey by means of electrolocation - this is the ability to detect the tiny electric impulses given off by animals when they move. WHAT DOES A WOLF EAT?